Although there are only a few million Buddhists in India, the religion is of great importance because it had its birthplace here. Buddhism is not a religion, since it was not created centered with a god, but is a system of philosophy and a code of morality. Buddhism was founded in northern India about 500 B.C. when Siddhartha Gautama, born a Prince, achieved enlightenment. The Buddha means "the awakened one". He was born into a wealthy kshatrya family in Lumbini in the lower Himalayas in today's Nepal. He renounced his wife, family and other comforts to go in search of peace and a way out of this world's sufferings. Some five years later, around the age of 35, after long meditation at Bodhgaya, near Gaya in Bihar, he attained Bodhi or enlightment while sitting beneath a Bodhi tree after a night during which Mara, the demon, taunted him with worldly temptations. He then stared imparting bodhi to others. His first sermon was called "Setting in motion the wheel of righteousness " and he delivered it on a July full moon night at Sarnath near Varanasi in Uttar Pradesh. This became the essence of Buddhism. He then toured India, preaching and organizing his followers into an ascetic monastic order of men and women called the Sangha. After his death in 483 BC, the Sanghas continued his teachings. There are two main sects of Buddhist schools. The "Theravada Hinayana" or "doctrine of the elders" or "small vehicle" holds that the path to Nirvana, the eventual aim of all Buddhists, is an individual pursuit. In contrast the "Mahayana" or "large vehicle" school holds that the combined belief of all its followers that will eventually lead to salvation. Existence comprises conflict, dissatisfaction, sorrow and suffering. This state is caused by selfish desires. The key to achieve all this is the eight-fold-path. In India, Buddhism developed rapidly when Emperor, Asoka, the Great embraced it. His capital was Patna and he declared Buddhism as the state religion. He put up monuments associated with the Buddha, and erected the Asoka Pillar. The Vinaya Pitakamainly deals with the rules and regulations, which the Buddha promulgated for the future disciples of the order of monks or Bhikkus and nuns. The Sutta Pitaka consists chiefly of disclosures both small and long as delivered by the Buddha himself on various occasions. The Abhidamma Pitaka contains the profound philosophies of the Buddha's teachings. It investigates matter and mind, the two composite factors of the so-called being. India's Buddhist temples are mostly found on the slopes of the Himalayas, in Himachal Pradesh, Ladakh and Sikhism. Buddhism's holiest site is the Bodhgaya in Bihar. The first Buddhist temples were stupas built to hold the relics of the Buddha. Unlike the other religious places these structures have no internal space for prayers, instead people circumambulate the Stupas. Later Viharas were built with the Stupas at one end. Circumambulating the Stupa should be done in a clockwise direction only. Maharastra's spectacular rock-cut caves of Ajanta and Ellora are largely dedicated to the Buddha only. The Gombas of Ladakh are also important spiritual places for the Buddhists. The Dalai Lama, the religious head of the Buddhists all over the world lives in a monastery in Dharamsala in Himachal Pradesh. The Buddhist trail from Sarnath to Bodhgaya attracts more pilgrims from foreign countries. Popular times of pilgrimage are full moon nights and the auspicious dates of Buddha's birth, enlightenment and death. Crowds of pilgrims clad in saffron or deep red ochre offer flowers, light oil lamps, set up flags and then go in for silent meditation, counting their beads and chanting verses from the Buddhist texts. 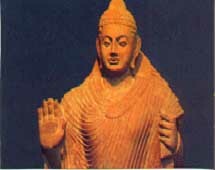 In modern India, both the Theravada and the Mahayana traditions of Buddhism are prevalent. 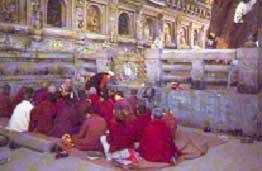 Of the total number of Buddhists in India, 94 % follow the Theravada tradition and the remaining 6% who live in the Himalayas are Mahayanists. Maharastra has the largest population of Buddhists in India. The other states that account for about 1% of the Buddhist population are West Bengal, Madhya Pradesh, Arunachal Pradesh, Jammu and Kashmir, Assam, Tripura, U.P, himachal Pradesh and Sikkhim.